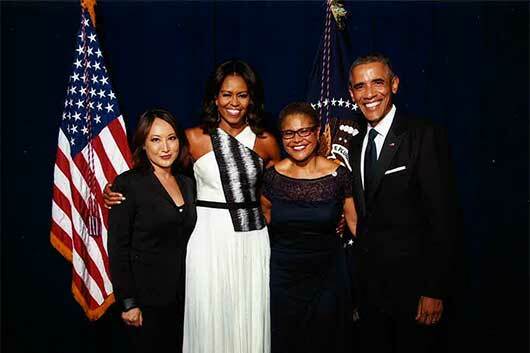 Photo: Mary Hayashi, First Lady Michelle Obama, Congresswoman Karen Bass, and President Obama at the 45th Congressional Black Caucus Foundation Dinner in Washington, DC. On October 6, 2011, Governor Jerry Brown signed Assemblymember Mary Hayashi’s bill, AB 25, making California one of the leaders in a nationwide movement to establish life-saving return-to-play laws in youth sports. AB 25, a concussion safety bill placed California alongside Washington as the states with the toughest return-to-play laws for student athletes. Co-sponsored by the National Football League, AB 25 requires a school district to immediately remove an athlete from a school-sponsored athletic activity if he or she is suspected of sustaining a concussion or head injury. AB 25 prohibits the return of the student until he or she is evaluated by, and receives written clearance from, a licensed health care provider. In addition, the bill requires a concussion and head injury information sheet to be signed and returned by that athlete and their parent or guardian before the first practice or competition. American Red Cross is a humanitarian organization that provides emergency assistance and disaster relief in the United States. The American Red Cross, California Affiliate honored Assemblywoman Mary Hayashi with “2011 Legislator of the Year” for her successful efforts to establish life-saving return-to-play laws in youth sports. California Medical Association is a professional organization representing the doctors of the state of California. CMA was founded in 1856 by a small group of physicians to advocate for their patients and for their profession. Today, the California Medical Association represents more than 40,000 members, and serves as the leading advocacy organization for physicians. The Legislator of the Year Award was established in 2009 to recognize state legislators who provide an exemplary contribution to the health and well-being of the people of California through their leadership in the political or policy arena. Mary Hayashi was the first legislator to receive this prestigious award in 2009 from the California Medical Association. Mary Hayashi served as the lead strategist for the California Pharmacists Association’s successful passage of SB493, the landmark legislation that expands the scope of practice for pharmacists. These expanded roles resulted in greater patient access to healthcare and improved the quality and efficiency of the healthcare delivery system. In 2015, Mary was awarded the “California Pharmacists Association Friend of Pharmacy” and the “California Pharmacists Association President’s Award” for leading the successful enactment of SB493. Founded in 1974, Planned Parenthood Affiliates of California has been a leading advocacy organization at the California State Capitol relative to reproductive health care and reproductive freedom issues. “PPAC’s vision and leadership has spurred lawmakers to enact legislation that makes California the number one state in the funding of family planning and other reproductive health care services” Since its founding, PPAC has played an important role in augmenting state funding for family planning and has had a leading role in the fight against anti-reproductive rights legislation for 30 years. Mary Hayashi was recognized for exceptional legislative achievements, and for significant contributions in women’s health care and reproductive rights in 2009. Honored as the Legislator of the Year for “extraordinary contributions to women’s health” in Alameda County. Mary Hayashi authored AB 2275, which increases consumer access to dental care by prohibiting dental insurance plans from setting fees for procedures that they do not cover. When dental insurance plans set fees for non-covered benefits, dentists are often unable to offer a full range of dental services to their patients. This bill prohibits that practice thus allowing dentists to provide a broad range of services. Recognized for legislative advocacy, which increased California park districts funding options. The Alameda County Democratic Lawyers Club Distinguished Public Service Award recognizes state legislators with significant public interest achievements. Mary Hayashi received the Community Service Award for linking people in need of mental health services to the agencies and community trainings for agencies, community groups, and the public. Mary Hayashi’s remarkable journey from her childhood in Korea to prominence as a health care leader is documented in her book, Far From Home: Shattering the Myth of the Model Minority. She has been honored by diverse organizations for her work on behalf of minority health and women, from Redbook Magazine and Ladies’ Home Journal. Honored for establishing unprecedented partnerships in support of Asian American women’s health that previously had no financial or public backing.